While camping in the mountains, you might see this Canada Jay (formerly known as the Gray Jay — but before that, as the Canada Jay! ), boldly swooping into your camp. This handsome jay’s big, black eyes seem to miss nothing — especially food. But the one food Canada Jays don’t eat is conifer seeds. The jays hide other food in conifer needles and tuck it under the bark of trees with their sticky saliva. With terrific visual memories, the jays can find thousands of hidden tidbits months later. Imagine you’re camping in the mountains, surrounded by pines, larch, and spruce. The very first bird you might see is a Gray Jay, as it boldly swoops down into your camp. This handsome jay has a smoky gray back and wings, silvery gray underparts, a tiny black beak, and big, black eyes that seem to miss nothing — especially food. But the one food Gray Jays don’t eat is conifer seeds. So why do they live in conifer forests? It turns out the jays hide food in conifer needles and tuck it under the bark of trees with their sticky saliva. Like other jays that cache** food, Gray Jays have terrific visual memories. They can find thousands of hidden tidbits months later. 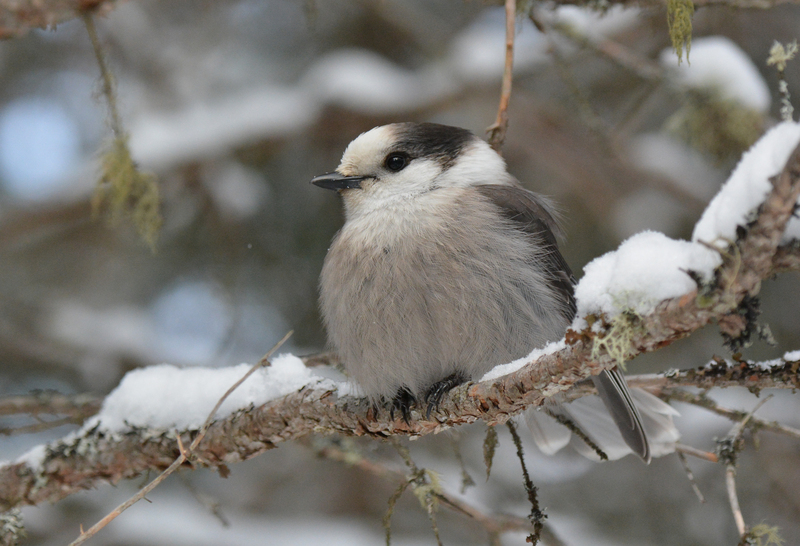 Gray Jays are so good at storing up food, they even start nesting before the winter ends. The jays can feed their nestlings entirely from the food they’ve stored away. And unlike most other birds that nest in spring and summer, Gray Jays spend that time caching food for the next winter. Bird sounds provided by The Macaulay Library of Natural Sounds at the Cornell Lab of Ornithology, Ithaca, New York. Recorded by Bob McGuire and Charles A. Sutherland.